A large public power utility in Canada and small electric cooperative in the U.S. are both benefiting from the use of software to manage the installation, maintenance, repair and upgrade of power-delivery equipment and comply with grid reliability and regulatory requirements. Officials with Calgary’s ENMAX and North Dakota-based McKenzie Electric Cooperative also emphasized the value of IPS ENERGY’s training and support during the software implementation process. “The equipment used to safely and reliably transmit and distribute electricity has become increasingly complex in recent years and it is critical for public power entities to maintain databases of when and where equipment is installed, how it is calibrated, and how it is maintained,” said Tim Schneider, manager of protection and control in the operations engineering department at ENMAX, the electric and natural gas municipal utility in Calgary –– the largest city in Alberta, Canada. Schneider said that this management task is enormous, given that ENMAX owns and maintains about 200 miles of transmission lines, 5,000 miles of distribution lines and more than 40 substations. Transmission and distribution systems consist of far more than poles and wires; they also include a vast array of sophisticated equipment designed to maintain power quality and reliability, he said. This includes protective relays, which are used to detect abnormal conditions and trip circuit breakers to prevent damage to key elements of the system. Previously, when ENMAX used mostly electromagnetic relays, it had to “calibrate maybe five or six settings per relay, said Schneider. Now, with the use of digital or “numerical” relays, each relay requires the calibration of hundreds of settings, all of which need to be archived in the utility’s database. “In the past, we had all the configuration files for all the relays sitting in folders on the company’s server,” he said. “The big issue was version control –– that is, if you have a Word doc or an Excel spreadsheet, how do you know who modified it last? How do you know if the file accurately reflects the latest modification to the relay?” Schneider said the bottom line was that ENMAX’s data keeping requirements had become increasingly complex, and that the utility needed to gain a better understanding of its existing T&D equipment, and when it needed maintenance and replacement. ENMAX also wanted to simplify the regulatory compliance process, which calls for the utility to provide reams of data on the status of its T&D system, to optimize planning for capital improvements. “We decided it was time to investigate whether there might be an elegant software solution to help us manage all this information more effectively,” Schneider said. ENMAX contacted several other utilities to ask how they manage their information, and invited IPS ENERGY to come out and provide a demonstration. The IPS-RELEX™ module (part of IPS-EPIS™, IPS ENERGY’s Enterprise Protection Information System product) serves as a single repository for protective relay data that the utility’s protection and control engineers and field crews share. “Say we were installing a relay manufactured by Company X,” Schneider said. “We would create a settings file using the vendor’s native relay software, then load that into the IPS database.” The field crews then would pull up the same setting file, test the relay, and if any in-the-field adjustments were needed, check with the engineers and make the setting change on the spot. All of this would be recorded in the shared file. “The IPS- ENERGY™ software also simplifies the process of providing grid reliability and regulatory compliance data to Alberta regulators”, he said. 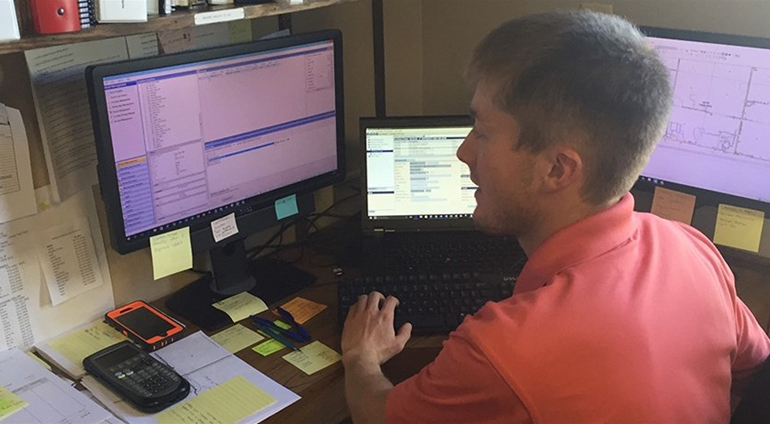 Zane Frick, reliability engineer for McKenzie Electric, works with IPS-ENERGY™ on asset management. Gary Highley, chief operating officer at McKenzie Electric Cooperative, said that his fast-growing co-op, which serves part of the Bakken oilfield region in western North Dakota and eastern Montana, also needed to improve data management for its T&D infrastructure. “The rapid growth of the Bakken oilfield resulted in unprecedented double-digit growth for us for several years. We essentially went from a small rural utility to a large industrial utility overnight,” said Highley. He explained that the co-op is now roughly 800 percent larger than when the Bakken oil boom began with more than 400 miles of transmission lines, more than 3,300 miles of distribution lines and 68 substations. Highley noted that the new transmission lines the co-op added to keep pace with its growing customer base and electric load “pulled us under the umbrella of owning bulk electric system assets which are now NERC-qualifying,” a reference to the North American Electric Reliability Corporation which maintains grid reliability through a compliance and enforcement program. Highley and Schneider both said that IPS ENERGY’s training and other support during the software implementation process has been key to their success. “We’ve relied on them heavily, not just for technical training, but for implementing industry best practices,” said Highley. Schneider said that ENMAX’s engineers and field crews have really warmed up to using IPS’s relay software, and suggested using it for reclosers, network protectors and other T&D system equipment too.